Are we ready to start this thing?? I hope I have allowed enough time for you to buy your binders and sheet protectors and to finish your cover page. And if you haven't done it yet, giddyup! So once you have your binders, gather up your markers, crayons, pencils and even scrapbooking supplies or religious stickers you might have. The more stuff the kids can use to decorate and bedazzle, the better! As we did last time, save the images and then drag-drop them into word or pages. You can print them from there. 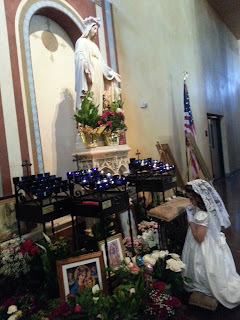 Catechesis: You may want to read the full exchange between the priest and servers at the foot of the Altar so they can get the full text of what is being said - if, that is, you think they can follow. This will be largely dependent on their ages and attention span. You could also do what I did - a general explanation about the prayers, with descriptions of what it will look like. I did the talking while they worked on their Page 1 activity. 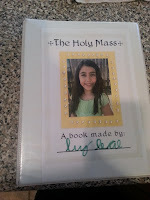 Some time ago when my family started attending the Novus Ordo in Latin, I had my girls work on making their own Mass book (aka missals) to help them follow along with the Latin prayers. I figured if they had made it, colored it and drew things about the Mass then they would be more engaged. I was right! They loved working on their Mass books and it gave me a chance to give them a little mini lesson on each part of the Mass. Since then, however, our Novus Ordo turned into an Extraordinary Form. Still Latin, but there are many silent prayers and it is a lot harder for them to pay attention. We bought them little children's missals but they seem totally disinterested in them. Since I am busy leading the Schola and my husband is busy baby wrangling, their disinterest may be a cause of their inability to find their place in the book without assistance.